A Modern Boho Favorite! Seriously! They are crazy comfy. You won't find a snugglier pair of socks. 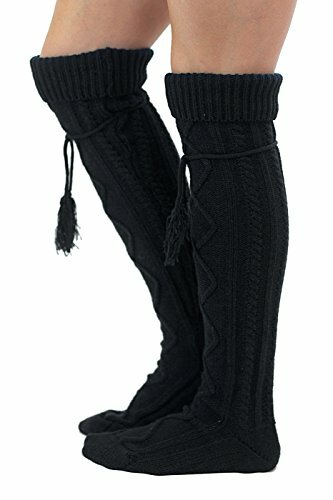 What better way for your feet to stay warm and cozy this season than with these darling boot socks? The simple tie at the top adds the perfect finishing touch. The tie is very versatile and can be worn many different ways. These socks are a must-have for any boot lover! Socks measures 20" from the heel to the top of the sock. Boutique Socks (TM) and Modern Boho (TM) are trademarks of Got Your Gear LLC and only sold by authorized dealers. Beware of counterfeit product from sellers in Asia. BEST QUALITY AND 100% GUARANTEED! ♥ ♥ ♥ Buy Risk Free! Our product is backed by our 90 Day Money Back Guarantee. Boutique Socks (TM) by Modern Boho (TM) is a premium brand sold only by Modern Boho (TM). Warranty only valid when purchased Modern Boho (TM). Comes in our exclusive branded packaging. TRENDY AND COMFY! ♥ ♥ ♥ Create Pin worthy outfits! Snuggling on the couch never looked this good, or was this cozy either! Modern Boho (TM) Brand is the creator of The Original Button Boot Socks. Read our product reviews to see why our customers love us! If you have any questions about this product by Boutique Socks, contact us by completing and submitting the form below. If you are looking for a specif part number, please include it with your message.